The opening of the exclusive Centurion Club on July 1st 2013 was a surprising event. Very few private clubs have opened during recent tough economic times and there is no shortage of golf clubs in this saturated golfing area to the north of London. Simon Gidman, formerly an assistant of the Hawtree design team, was chosen by the Centurion owners to fashion the exclusive golf course. The Centurion management decided not to pay the design fees associated with a big named architect and chose instead a relatively unknown designer with a modest portfolio. The Centurion Club is located to the west of St Albans in rural Hertfordshire countryside and we were invited to play the course shortly after its official opening. With woodland flanking the first five holes, there’s a feeling of maturity from the off and there’s more than a passing resemblance on these early holes to those located at nearby Brocket Hall and a few miles further north at Woburn. There’s an open country feel at 6 and 8 though 13 (reminiscent of the London Club) and from 14 to 18 you are transported to Grove-like holes. Donald Ross thought that “variety is the spice of golf, just as it is in life” and so, if you seek variation and you have a few spare pounds in your pocket, then the Centurion Club may be for you. However, if you want to experience an exciting new golf course but don’t want to join, you’d better start looking right away for a friendly Centurion member to sign you in. The inaugural Golf Sixes event concluded with Denmark winning the final against Australia on the closing green. It remains to be seen whether or not this particular format will become golf’s equivalent of cricket’s Twenty20, but it was an encouraging start and an exciting respite from the usual strokeplay humdrum. I’ve been umming and ahhing over this review for some time. It’s not easy to be objective about a course that isn’t your cup of tea. My feeling is that Simon Gidman has done a good job with land that has plenty of interesting movement. The routing is actually very clever – it’s effectively out-and-back, in anything but a straight line. Eight holes occupy two completely separate parcels of ground, linked by two connector holes at #5 and #14. The more compelling holes, through the pines (which crop up in most photographs), occur at the start of the round. These would be better suited to appear at the end of round, but the location of the clubhouse is a constraining factor. The closing holes are not bad, but they just don’t compare favourably with the opening holes. So instead of finishing on a crescendo you come home on a diminuendo. As I already said, the closing holes are decent enough, but they’re not holes that will stick in the mind for very long, except perhaps for the exciting water-protected closer. I enjoyed my day here on a blustery sunny day last summer, but left feeling underwhelmed. The wind direction on the day was blowing the adjacent M1 traffic noise constantly across the course and the bent grass greens (that were part of the club’s early marketing promotion) are not quite as pure as I’m sure they were when the course first opened for play. Clearly the club is pitching at wealthier clientele, and I can absolutely see why the upwardly mobile might choose to be members here, but it’s not to my tsate. Perfect Corporate Venue. Whilst the course is very pleasing and the first 6 holes are absolutely stunning opening holes, the back 9 loses the links with the firs and with that loses a little bit of character. the course is built to be played off the back tees, some of the holes off the forward tees lose all character whilst off the backs it is a completely different look and feel. The food in the clubhouse is absolutely gorgeous and the wine selection is far beyond the wine you would get at most clubs. I'm thoroughly looking forward to returning when the "Summer" weather returns. Ultimately, this isn't in the same league as the Surrey Sand belt clubs, but feels much more welcoming and focused on the experience rather than just the course. New and brash, but soulless. Certainly worth playing once so you can say you been there but I wouldn't return unless in receipt of a member's invite and, even then, I would choose other courses if I could. The course has settled down well and it is in great condition, similar to The Grove. The first few holes are a bit like Woburn but after that, it becomes a bit of a slog to be honest and I hit a decent ball lengthwise. After 15, the Clubhouse is in sight and I was ready to call it a day but, at least, the 16th is a great par 4 (Stroke 1). 17 and 18 are a bit disappointing. The new clubhouse is very smart but classy it ain't!! The car park is full of white Range Rovers with black wheels - says it all, really. Sorry, it's a Miss for me. On a recent visit the golf course at The Centurion Club was every inch playable, and indeed highly enjoyable, although there is still very much a work in progress feel to the entire experience. This will clearly change over the coming months as the project approaches its conclusion and there is no doubt that the finished article will be hugely impressive. The most unusual thing about this big and bold modern inland layout, near Hemel Hempstead just north of London, is that there are more par fives than par fours! All told there are seven three-shotters and whilst none of them, with perhaps the exception of the 543-yard last, are overly taxing in terms of length there’s probably four too many of them for my liking! This is not a criticism of the par 74 Centurion Club specifically. It’s just that it appears that no modern golf course ever seems to have a par less than 72, certainly never fewer than 71, and as a result tend to have at least four par fives; arguably the most uninteresting type of hole in golf, especially when consumed regularly. As a side note few new builds have one of the most fun types of hole; a driveable par four. The uphill 357-yard tenth is the closest we get at Centurion… so that rules most of us out unless your name’s Bubba. What was pleasing compared to other newbies, and really noticeable here, is that you don’t return to the clubhouse until you finish on the 18th. Having recently played several layouts built since the turn of the millenium it was refreshing to be taken on more of a journey here and not return to the clubhouse halfway through your round. It should be noted that from the silver competition tees the course, which strongly favours the aerial game, plays a very manageable 6,756-yards so it’s far from a slog and you could argue that bigger hitters will have a plethora of birdie chances which may increase satisfaction levels. Perhaps it’s just a ploy to please the members! A good one at that. NB: The course plays as a par 72 from the ‘black’ championship tees although these don’t feature on the regular scorecard. The course, designed by Simon Gidman, meanders over spectacular topography, features almost 100 bunkers and has four major water features. There are two specific parts of the layout which are linked by stunning short holes at the fifth and 14th. The strength of the course is arguably the par fours though. There’s only half a dozen of them but the third, seventh, 12th and 16th are four of the strongest holes on the course, each one featuring a dog-leg to the right but all very individual in appearance. Centurion is certainly atypical to a traditional English private members golf club, however, it is clear that the owners are developing a place, a community if you like, where their members are the lifeblood and where they can enjoy the finer aspects of life alongside good quality golf. It’s not personally the type of club I’d seek to join but then again I’m not an ex-Premier League footballer or multi-millionaire. Living locally, the Centurion Club certainly held a lot of intrigue for me. Luckily for me, a good friend has recently joined so I had an opportunity to play and I certainly wouldn't pass up on it having not played much recently due to my own course being closed. As soon as I arrived there was somebody there to greet me and help with my things (I know this doesn't impact upon the course but it certainly added to the experience). The course itself was first rate, as mentioned above there is a mixture of styles and the course is mature beyond its years. I found it a fun challenge to play, there were a lot of opportunities for (nett!) birdies but trouble lurking for any errant shot. The greens were pristine, I was pleasantly surprised that they were quite firm and very fast. All the holes are strong, but for me the 6th, 12th and 18th are the stand out holes. The previous comment about the temporary clubhouse is a little harsh I felt, I played the Trump course at the back end of last year and Centurion's is much better. Overall I had a fantastic experience and I'm very tempted to become one of the lucky few to enjoy this place every day! Played it late last year and have to honest in saying I wasn’t keen. There was not a clubhouse and I know that the land used has been landfilled for a number of years. The course looks great in pictures but I found it a little cramped and the wind was probably blowing the wrong way that day as there was a great deal of traffic noise from the nearby M1. Maybe with a proper clubhouse and some atmosphere (other people) it will improve? How can a clubhouse and people improve a course? Yes it will help with the club atmosphere and the vibe but not the course. Seeing this enter the English Top 100 after only six months says a lot - yes not the finished article yet but the course has already started to get plenty of decent comments form those who have played. It would not surprise me if in time the Centurion can have a great country ranking. I played this course in late November and had an outstanding day. The condition of the course, welcome at the club, together with the challenge and variety of the course will make this course one of the very best. 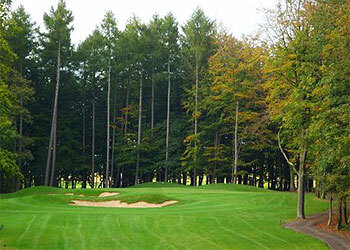 The first five holes are played through mature pine trees and are reminiscent of Woburn, particularly the Duke's course. It is a tough start, especially the dogleg par four 3rd, which requires a long straight drive to get to the corner followed by a long iron uphill to a well bunkered, two-tier green with false front. A four is a great score here. The 6th and 7th run alongside woodland and these two visually stunning and challenging holes complete an extremely strong start to the course, surpassing even the first six holes on Woburn Duke's. The course then turns away from the woods from 8th-13th and the challenge becomes strategic bunkering, elevation changes and magnificent views. The bunkering down the right hand side of the 9th is excellent, just on the line you want to hit down, whilst on the par five 13th three large bunkers goad you into trying to hit over them from an elevated tee to enable the green to be reached in two. Finally the course comes back through the pines (14th) and through to a lovely finish of risk-reward holes: 15th, 17th and 18th all represent decent birdie opportunities if the weather and pins allow. The conditioning of the course is outstanding despite its tender age and will undoubtedly surpass Woburn and the Grove in this regard when it matures. The variety of holes - only once are there two consecutive holes of the same par - is similar to the Berkshire (Red) and keeps the interest levels up throughout the round. I stood on the 17th tee feeling slightly beaten up by the course yet disappointed the round would be ending soon. I see this course squarely in the Top100 in Britain in the next few years and pushing the Top 50. If you get a chance, play it. England’s newest course and this arrives with a lot of anticipation of being one of the very best new builds in recent years. I was lucky enough to play on a hot sunny August day and I have to say, what a great experience. There are no pay and play options unless via an invite from a member, so there are limited chances for golfers to sample the course but that is the model chosen by the team and I wish them good luck – the car-park seemed pretty full when I was there, so the early signs look favourable. The course is already set-up nicely, with the early holes tree-lined and then from the 6th onwards out on to open ground that has been shaped beautifully. One of the best shots on the front nine is the one to the 7th green – the hole is a par-4 of around 400 yards but it is the approach needs special attention as there is a pot bunker, some dead ground and a hillock protecting. The 13th is a classy par-5, around 520 yards with great definition between the rough and the fairway – the hole is pretty straight but the collection of four bunkers on the right of the fairway gives a slight dogleg feel. This course is obviously ‘work in progress’ with plenty of young trees around the course waiting to define some of the open areas but there is already a good feel here and if you can get along, I would recommend it. The previous newest course in England was Close House in the North-East and that has already broken into the country Top 100, the Centurion must be heading that way in the coming years too. Fantastic golf course with unlimited potential. No hole is the same and it offers a challenging but fair test for all golfers. You do need to be straight off the tees though! The greens are perfect and you get a true roll on all of them. You will not be disappointed if you ever get the opportunity to play this course. Love the course also but just a minor point on this review, I thought that the 8th and the 10th holes were very similar.